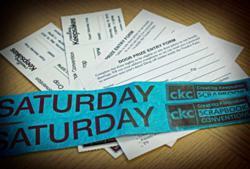 Attendees at CKC-St. Louis who register online are entered in a drawing for a $100 Visa Gift Card. Online registration closes Thursday, May 31, 2012 at midnight ET. Scrapbookers in the St. Louis area who register online for classes, shopping, and crops are automatically entered in a special drawing for a $100 Visa Gift Card. Online registration closes at midnight ET on Thursday May 31, 2012. Online registrants also save money (online classes are $2 less than tickets purchased at the convention) and receive free items, depending on the number of classes and activities purchased. Attendees that are unable to register online can purchase class and crop tickets as well as shopping passes at the convention starting the afternoon of Thursday, June 7. A $3 off coupon for the Vendor Faire (shopping area) is available online the week of June 4th. For more detailed information, please visit http://www.CKScrapbookEvents.com/stlouis.